The Wallflowers have announced they are back in the studio and putting the finishing touches on a long-­‐awaited new studio album that will be released by Columbia Records this fall. Currently recording in Nashville at Dan Auerbach’s (The Black Keys) Easy Eye Sound studio, the new album finds frontman Jakob Dylan joining original band members Greg Richling (bass) and Rami Jaffee (keyboards), with Wallflowers’ longtime guitarist Stuart Mathis and drummer Jack Irons (Red Hot Chili Peppers, Pearl Jam) rounding out the lineup. The album is being produced by Jay Joyce (Emmylou Harris, Cage the Elephant) and mixed by Rich Costey (Bruce Springsteen, The Shins). The Wallflowers have taken their deep history and defining sound into new territory with the release of their upcoming album. The new record has the band doing what it does best while continuing to find new ground to cover. “It’s been a while since we’ve felt this energized and creative. We haven’t changed our stripes so much as we’re continuing to redefine the animal,” said Jakob Dylan. In addition to their new album, The Wallflowers have announced a series of tour dates that will kick off in select U.S. cities in July (please see dates below). On these dates the band expects to give fans a preview of the new material, which finds them rediscovering their sound while reflecting the varied influences they have accumulated over the years. 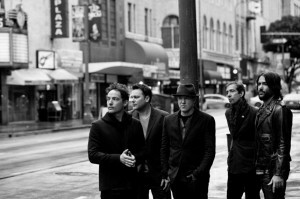 Formed in Los Angeles, The Wallflowers rose to fame with their 4x platinum album Bringing Down The Horse, which featured four top charting singles including “6th Avenue Heartache,” “One Headlight,” “The Difference,” and “Three Marlenas.” The two-­‐time Grammy Award winners went on to sell over 7 million records worldwide with a series of critically acclaimed albums before going on hiatus in 2007. During the group’s break from recording, Jakob Dylan released two solo albums, which also garnered significant praise, 2008’s Seeing Things and 2010’s Women and Country.